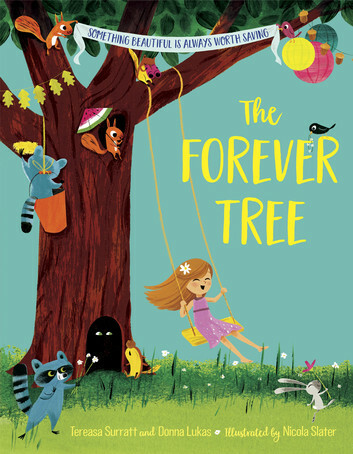 The Forever Tree is a story inspired by a real tree in Wisconsin at an old summer camp. This tree becomes an important part of the community, not only for the people, but for the animals. The book follows the tree while it grows and the animals interact with it. One day a grandfather hangs a swing on the tree for his granddaughter, attracting families from all around. The tree becomes an integral piece of the setting and the events there. Years pass and one day the tree does not reawaken and the grandfather does not return. Rather than forget the tree and the memories that grew there, the community (people and animals alike) rally together to build a treehouse around the tree to keep the special moments coming for future generations. The treehouse is a fitting legacy to both the tree, and the grandfather.